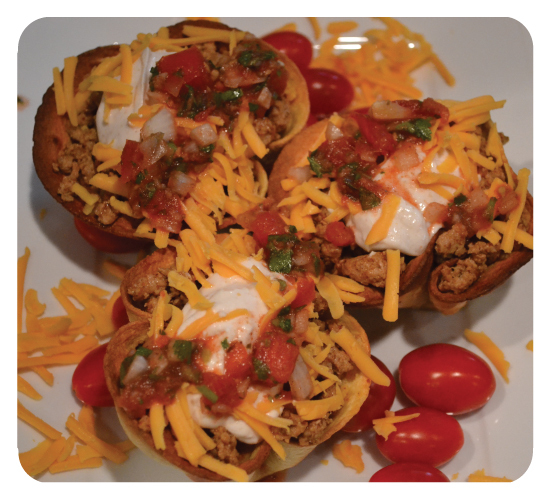 turkey taco cups | Is there any wine left? 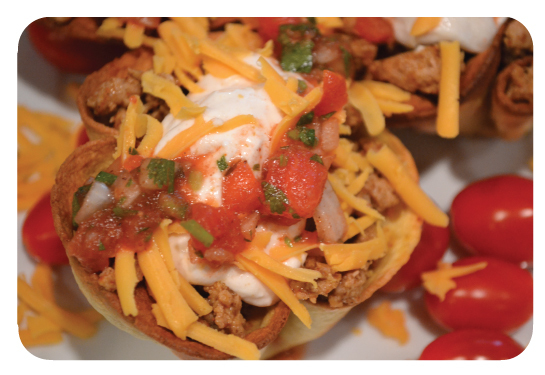 These taco cups are my new favorite weeknight Mexican dinner. They are done in less than 30 minutes and are healthy! I wasn’t a huge fan of corn tortillas (and why would I be when H-E-B makes the best butter-flour tortillas in all the land?) until I tasted how great they are once they’ve been baked. They are crispy and salty (yeah, I added a little salt) and delicious. To make the tortilla cups, stick the tortillas in the microwave for 15-20 seconds to soften them, then tuck them into the cups of a muffin pan. Spray the tortillas lightly with Pam and sprinkle with sea salt. Bake them at 425 degrees F for 20 minutes, until brown and crispy. While the tortilla cups are baking, start cooking the ground turkey. Once it has browned, add the taco seasoning and 3-4 tbsp. water. Continue to cook over medium heat until the water has evaporated. I serve these with flavored fat-free Greek yogurt, shredded fat-free cheddar cheese and fresh salsa. I like to use fat-free Greek yogurt instead of sour cream because it is much higher in protein and lower in calories and fat. It has a distinctively tangy flavor but it can easily be masked by adding cumin and Cholula hot sauce. To assemble the taco cups, fill them to the brim with the ground turkey then top with the flavored yogurt, shredded cheese and fresh salsa. I like to shake Cholula over them a few times too! While the tortilla cups are cooking, start cooking the ground turkey. Once it has browned, add the taco seasoning and 3-4 tbsp. water. Continue to cook over medium heat until the water has evaporated. I like to use fat-free Greek yogurt in Mexican cooking instead of sour cream because it is much higher in protein and lower in calories and fat. However, it still has a distinctively tangy flavor which can easily be masked by adding cumin and Cholula hot sauce. I also serve these with shredded fat-free cheddar cheese and fresh salsa. To assemble the taco cups, fill them to the brim with the ground turkey then top with the flavored yogurt, shredded cheese and fresh salsa.